If you control a Spellcaster monster: You can target up to 2 Dragon monsters in your GY, including at least 1 Normal Monster; Special Summon them. Your opponent takes no damage this turn. You can only activate 1 “Dragon Revival Rhapsody” per turn. Dragon Revival Rhapsody is another new card that will help the Blue-Eyes archetype. 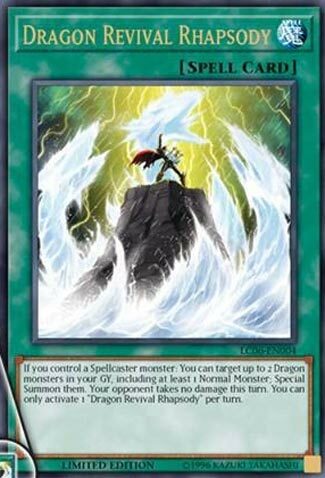 Spellcaster-Type monster is an easy requirement for the card, most of the tuner monsters in the Blue-Eyes archetype are Spellcaster-Type, as well as Lord or King of D. Two Dragon-Type monsters Special Summoned from the grave is a great effect off one card at no cost, one of them needing to be a Normal monster like Blue-Eyes White Dragon. Fusion Monsters without effects, as well as Dragon Spirit of White are also an option. While you can’t do any damage, you can still clear out their field with attacks. A fun card the deck can use with relative ease to swarm the opponent’s field. It is like a watered-down version of Soul Charge for Dragons only, but better in certain ways. Dragon Revival Rhapsody is a Normal Spell Card with no cost that Special Summons up to 2 targeted Dragon Monsters in your grave if you control a Spellcaster monster. One of the Dragons has to be Normal, and your opponent takes no damage that turn. Obviously, this is meant in a Blue-Eyes deck, but it might be useful in Red-Eyes as well. Hieratics might be able to get some Tuners out as well. The Spellcaster could be Lord or King of D., but some other easy options are Chaos Sorcerer and Aleister. It’s hardly worth noting, but Dragon Revival Rhapsody can only be used once per turn, no extended ballads. 2 puns for the price of one. Score: 3.75/5 Art 4.5/5 Killer name as well. As I mentioned, we would get to Dragon Revival Rhapsody and here we are. If you control a Spellcaster monster, you can target up to 2 Dragons in the GY including at least 1 Normal Monster and Special Summon the both of them. In return, your opponent takes no further damage and you can only use this card once per turn. Nice little comeback tool, despite the fact you need a Spellcaster. I believe Sage with Eyes of Blue is a Spellcaster, I know both Lord of D. and The King of D. are Spellcasters. You need to have a Normal Dragon, so Blue-Eyes comes to mind to use this in, since Dragon Spirit of White is treated as a Normal in the GY. Solid card for coming back or making a bigger board, just stings that you can’t OTK with it. Rhapsody is a cool word, and as you probably expected some time this week, here is Dragon Revival Rhapsody. Normal Magic card…if you control a Spellcaster, you get to Target up to two (worth noting the up to part, because too early, you might not have two, even if that’s probably not using this card to full potential) Dragons from your Graveyard. One has to be Blue Eyes White Dragon…err a Normal Monster, I mean. Your opponent takes no Damage this turn…that does seem fair, but steep too. No Battle Damage would have been enough, so maybe you could still Burn or something at least. But it hardly breaks the card. Only one of these can be activated per turn, which adds a little balance and control to this card. It’s a +1, as you (potentially, referring to the beginning of the review) get two Monsters for just this card. Good for BEWD engine for sure, as well as many of its variants, and would work in a Dragon focused Dark Paladin Deck…do I get anything for a self reference?